I know, I’m some kind of frittata renegade. Aren’t frittatas supposed to be FILLED with tasty things, not topped with them? Probably. But I’m digging using a simple egg base in place of bread-like things lately. Like I did here with this Breakfast Pizza Frittata. Which got me thinking: if it worked so well in that recipe, how about using the same base as part of a paleo-ized homage to my former favorite brunch, Smoked Salmon Cream Cheese Bagels? And so, I made this salmon frittata! The egg base – we nickname them “egg cakes” around here because they look like pancakes.. but aren’t – holds up nicely in place of the usual empty-carb-fest that is the humble bagel. Then I went and layered smoked salmon right on top. But it was still missing a little, shall we say, pizazz? Plus, if I’m honest, I was still craving cream cheese with my salmon frittata. Because there’s something devilishly compelling about the richness of smoked salmon paired with the creamy soft cheese. Not gonna lie. Instead of reaching for the nearest block of processed dairy-food, I decided that this bad boy of a smoked salmon frittata needed a sauce to impart some of the soft cheese-like lusciousness. I’d made a Green Onion Dressing the day before that I figured could stand in for cheese AND the usual thin slices of red onion I used to love with smoked salmon. It totally worked! Want to know the best part about re-using the leftover Green Onion Dressing? Because it had coconut milk as a main ingredient, being in the fridge overnight had thickened it up. So instead of a thin liquidy salad dressing, I had a thick and creamy sauce! Perfect. I gave it a good stir and used it to top the finished Smoked Salmon Frittata. The green onion sauce added a zingy boost of subtle onion flavor AND was creamy enough to make this cream cheese cravin’ girl completely satisfied. Without dairy – hoorah! Because the green onion sauce does need refrigerating to thicken it up, I suggest you make it the night before you want to brunch it up in style. That way, it will be ready to go in the morning and you don’t have to wait around on it. Plus, one less task to do in the kitchen of a morning is always a good thing! 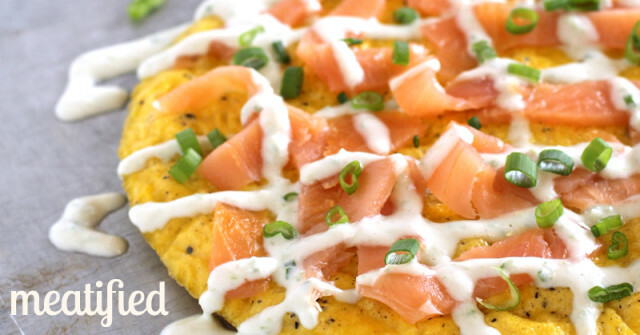 This smoked salmon frittata is a paleo reimagining of my former favorite brunch: lox & bagels! Load up with as much smoked salmon as you like – enjoy! This recipe is Whole 30 compliant. Green Onion Sauce, made in advance and refrigerated. Sliced green onion for garnish. Add the cooking fat of your choice to a 10 inch skillet over low heat. Remove the hot pan from the broiler with oven gloves and slide onto a cutting board or plate. Top with the sliced smoked salmon, green onion sauce and extra chopped green onions before serving. To make the Green Onion Sauce as thick as pictured here, you will need to make it in advance and refrigerate it. Otherwise it will be more liquid, like a traditional pourable dressing. Just made this for breakfast this morning. Didn’t have the ingredients to make the green onion sauce (just the green onions for some garnish), so I substituted some avocado slices on the side to still get that creamy-healthy-fat-deliciousness in there. All I can say is, YUM! Thanks so much for the idea, I’ve been looking for more ways to incorporate smoked salmon since I love it so much! Salmon and avocado is a winning combination, so glad you enjoyed it! Love love this recipe and the sauce!! Have been using this sauce on salmon and tuna cakes too!! How long is the sauce good for if kept in an air tight container in the refrigerator? Is there a Whole 30 compliant substitute for the cashews in the green onion sauce? I’m allergic, but this all sounds delicious! Just made this – A.MAZ.ING. This looks amazing. I’m actually going to make the green onion dressing for chicken tacos tonight. One problem, my daughter is allergic to all tree nuts except almonds, so no cashew cream for us. Will almonds work for this instead? Thanks. I haven’t tried that out, but I don’t see why it wouldn’t work. You’d have to soak them the same way, but the flavor should be neutral enough to work in place of the cashews. Made it for breakfast today, including the green sauce, and it was soooooooooooo good! Thanks heaps!! This looks yummy, but I have a relatively new tree nut allergy. Is there something else I can substitute for the cashews in the green onion sauce to get as similar a product as possible? Thanks! Just wondering if you could make a batch of these and reheat or do you think they need to be made fresh each time? You could, but bear in mind that reheated already-cooked eggs firm up even more and can be on the rubbery side. Perhaps make a thicker, doubled up version to cut into slices and eat cold? Never done eggs like this before – about how long should it take in the oven for them to be set? Are you talking about baking them in the oven, or popping them under the oven broiler, per the recipe? 1-2 people, depending on how hungry you are and if you’re serving it with anything else. Do you have the nutrition information for this? Looks delish! Hi Rachael, I don’t track nutrition info myself, so the easiest thing for you would be to add the ingredients to a tracking app in order to find out the nutritional breakdown that way. Pingback: Whole30 Meal Plan: Week 3 - Caroline Fausel Paper Co. Thanks for this recipe. I love this, super delicious and easy to prepare. Great job.